Intuitive and easy to use technology that just makes sense. At Endeavor Exteriors, we think of your project as more of an experience than mediocre, traditional construction. The online platform you’ll use throughout the project is just that — an experience. 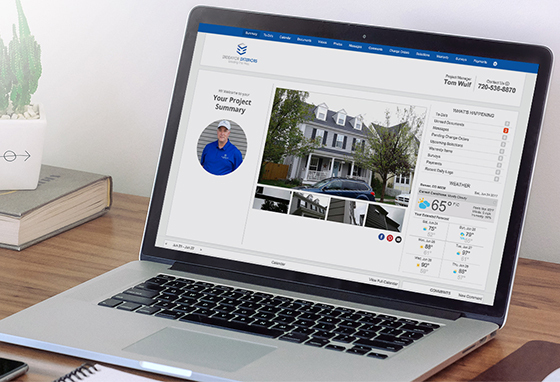 You’ll get access and updates to the information that matters the most to you in an easy-to-use online platform that makes your insurance claims or home improvement projects fun. There’s even an app for that! Spend less time wondering and more time living. On average, a typical insurance restoration project can take anywhere from 90 to 180 days. That’s a lot of phone calls, emails and text messages between you and your Denver roofing contractor. A good majority of that time can be spent wondering when work will begin, when different phases will be scheduled and what is happening between your insurance company and contractor. We’re here to say that it doesn’t need to be like that anymore. You can choose between emails or text messages, or both. We’ll send you notifications in real-time from our office to you to keep you up-to-date on all progress with your home improvement project. We collect before, during and after photos of all the work occurring with your project. These are conveniently organized so it’s easy for you to see everything that is happening on your property without needing to physically be home. Project documents, including contracts, estimates, insurance claims, lien releases, warranties and more, are more accessible than ever. Everything related to your project can be found in an easy-to-find online filing cabinet that is available to you, all the time. If you’re not sure whether to paint the entire house or just the sides that insurance paid for, do not fret. Once you’ve signed into our platform, creating and accepting change orders is as easy as clicking a button. There is no need for you to make hasty decisions. Scheduling your project has never been more transparent and fun. You’ll see the dates that all work is scheduled weeks before a hammer is swung. You’ll have plenty of time to plan and prepare around your project. We’ve been doing this a long time, which means we know how to give you a great experience. Along the way, you’ll get professional insider tips on what you need to do to ensure your experience is as great as we’re planning for. Filing your claim just got easier. We work with the top insurance companies so your claim is approved and processed quickly. Get started today.